Specifications: Battery Capacity: 18000mAh/66.6Wh Size: 7.48*3.54*1.73 inches Weight: 650g USB Outputs: 5V/2.1A 5V/2.1A Input: 15V/1A Starting Current: 500A Peak Current: 800A Super-Fast Shipping – Get Started 48h from Now with Amazon Prime! 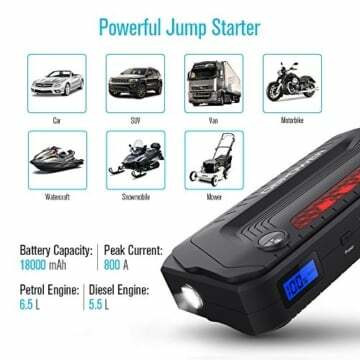 What You Get: 1x Jump Starter G09D 1x Jumper Clamps 1x Charge Adapter 1x Car Charger 1x USB Cable 1x User Manual #1 Rated customer support. CLICK THE YELLOW ‘ADD TO CART’ BUTTON ABOVE NOW!